Framing is up to the top floor of the former Chapter House property at 400-404 Stewart Avenue. The plywood ZIP Panels appear to switch from the roofing variety to standard walls on the top floor and for the recessed entrance on the ground floor, and this probably has to do with the finishing materials. The ZIP panels have slightly different thicknesses. The thinner ones in green are used with fiber cement, and wood or asphalt shingle finishes. The top floor of the Chapter House is supposed to finished with asphalt shingles, according to planning docs. 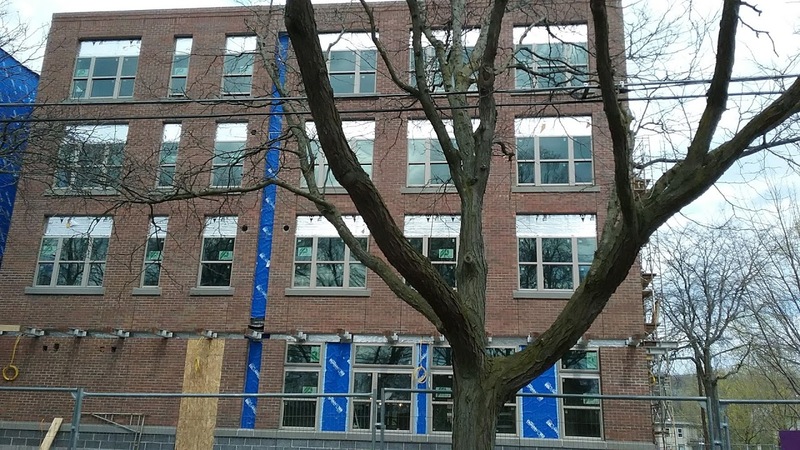 The lower two floors with the red ZIP panels will be faced with brick (Redland Heritage, the same brick used with 210 Hancock’s commercial building). The north wall has already been coated in waterproof spray foam, which will protect the frame from the porous brick veneer. It looks like some interior framing and roughs-ins are underway on the lower floors. Next door, the slab foundation for the new apartment building at 406 Stewart Avenue has been poured and cured, and framing work appears to be starting on the above-ground levels. Along with local firms Taitem Engineering (overall civil and structural engineering, with emphasis on energy efficiency) and Elwyn & Palmer (civil and structural engineering with emphasis on geotechnical work and foundations), a New Hampshire company called “Overlook Construction Consultants” identifies itself as a project partner, but their online presence is nearly nothing. Jason K. Demarest is the architect for both buildings. Project description and background here. Has there been any update on whether the Chapter House will actually be returning as the tenant? This was still up in the air last time. I have heard no updates. Maybe it’s just me, but this seems to be going up at a nice pace. I too am curious about the return of The Chapter House. I’m not making conclusions until all is said, done and proven.